Source: SlipNot Safety Flooring, Div. W. S. Molnar Co.
SlipNot Safety Flooring, Div. W. S. Molnar Co.for use on a flat grid (3/4 No. 9 flatten expand metal), Grid Grip safety flooring flexes and helps reduce worker fatigue. 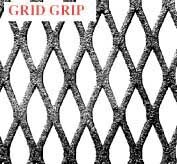 It is easily cut with a torch or shear and tack welded to existing plate or grating on structures such as existing stairs, ramps, and platforms. SlipNot Safety Flooring, Div. W. S. Molnar Co.